This beautiful ring contains a cushion cut fancy diamond centre stone, which is framed in a gold single row halo setting and finished with diamond shoulders along the sides. Cushions cuts are a popular choice for fancy diamonds (the name given to coloured diamonds), as they tend to bring out stronger colour shades. As a result, it is also uncommon to see fancy colour stones produced as round brilliants, which is the most coveted cut for the more traditional ‘colorless’ stones. 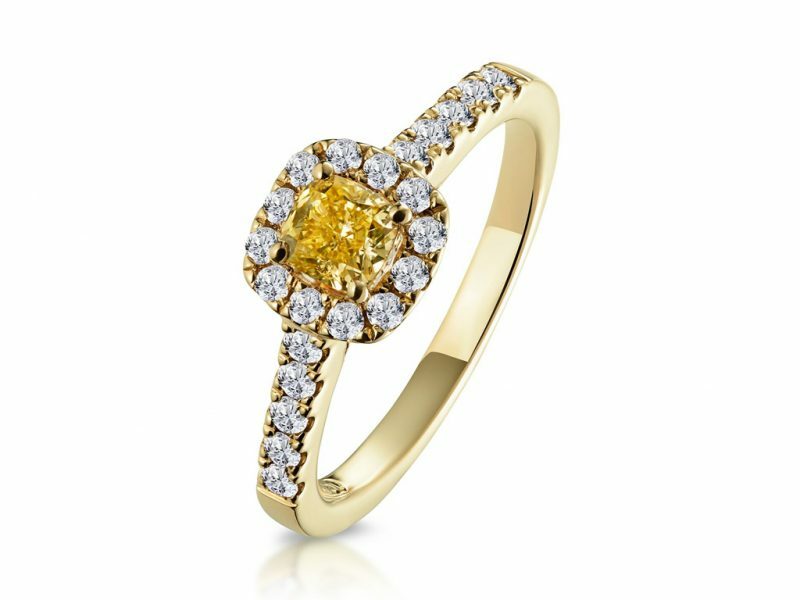 Surrounded by a stunning halo of colourless diamonds, the centre stone really stands out. Halos are a good investment if you want to bring attention to and highlight the centre stone as they give the illusion of a bigger stone. This ring would make a great alternative to the very traditional silver/platinum engagement ring with a round cut colourless diamond or for a stunning anniversary ring! If you have any questions on this style of ring don’t hesitate to get in touch! We have helpful and knowledgeable staff that will be happy to answer any enquiries you may have. We also offer a bespoke jewellery design service, so if you like this design, you can reference this and we can craft one in our on-site workshops. For more information on fancy diamonds, take a look at our guide here. If you would like to see similar styles of cushion cut fancy diamond gold then you can click here and here. This entry was posted in Jewellery Spotlight. Bookmark the permalink.